Bus Drivers in Tehran, support the workers of Haft-Tappeh sugarcane factory, who have been on a protest for the past month. The Haft Tappeh workers received a boost when the Greater Tehran Bus Syndicate issued a public statement supporting their strike and condemning the arrest and regime violence against its labor activist, Esmaeel Bakhshi. 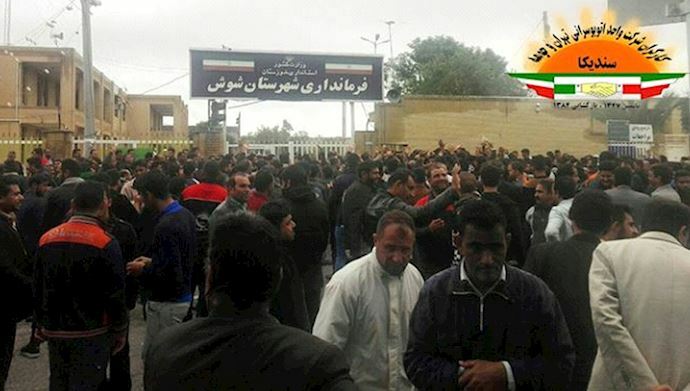 Brave Haft Tappeh sugarcane workers rally outside Governor's Office in Shush on Thursday (Day 25 of #IranProtests) chanting 'imprisoned workers must be freed'. The Haft Tappeh workers have been on strike over unpaid wages and the forced privatization of the company for almost eight weeks. Bakhshi was arrested, along with 18 other protestors during the first week of the protest. While most of the other protestors were released shortly afterward, Bakhshi and several others were kept in regime custody. News later emerged that Bakhshi was rushed to hospital after sustaining serious head injuries in regime custody. The Greater Tehran Bus Syndicate echoed the Haft Tappeh workers calls for Bakshi’s immediate release and the closure of any outstanding judicial cases against the Haft Tappeh protestors. The regime has resorted to its usual threats and oppression in an attempt to end the Haft Tappeh protests. The mayor of Shush, accompanied by the Islamic Revolutionary Guards Corps (IRGC) and plainclothes officers approached the protestors to issue threats unless they stopped the protests. 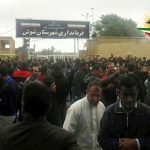 Haft-Tappeh Sugarcane Mill worker and labor leader, Esmail Bakhshi who was arrested during the workers protest has been tortured & transfers to the hospital. The protesting workers would not be deterred, instead of mounting chants against the corrupt mayor, and renewed chants of “jailed workers must be released”. The arrests were also designed to create a climate of fear among protestors. However, they backfired. In the face of mounting regime violence, the protestors of Haft Tappeh have only received reinvigorated public support. Many of Iran’s youth have taken to the streets with the striking workers in a clear display of solidarity. The Iranian resistance group, the People’s Mujahedin Organisation of Iran (MEK), also issued words of support. The President-elect of the Iranian opposition, Maryam Rajavi, took to Twitter to call on the Iranian public to stand with the brave workers. Students from Tehran’s Art University also paid homage to the striking Haft Tappeh workers. Whilst holding their own anti-regime rally, the determined students chanted, “we’re the workers’ children, we will stand by their side”. It wasn’t just Esmaeel Bakhshi that was detained on bogus charges, the former head of the Haft Tappeh sugarcane mill syndicate, Ali Nejati, was abducted from his home by regime forces and taken to an unknown location. His loved ones are concerned as Mr. Nejati has a heart condition and was reportedly unwell when regime agents raided his property. He reportedly asked to see a warrant from the regime agents, but they were unable to produce a document.